In mixed pair, India’s Bachiraju Satyanarayana and Kiran Nadar finished fifth to miss out on a medal. Jakarta: Pranab Bardhan became the oldest man in the Indian contingent to win a medal at the 18th Asian Games as he joined forces with Shibhnath Sarkar to clinch gold in men’s pair event of the bridge competition on Saturday. 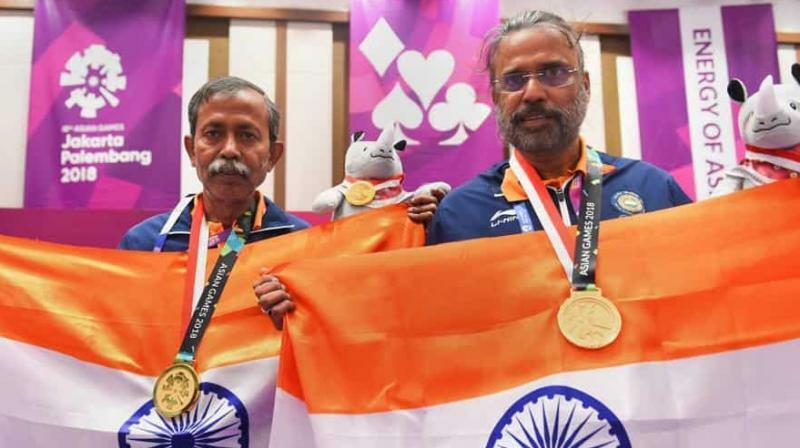 The 60-year-old Bardhan and his 56-year old partner finished the men’s pair event with a score of 384 as they edged out China’s Lixin Yang and Gang Chen, who finished with 378 points after five round of competition. Indonesia’s Henky Lasut and Freddy Eddy Manoppo finished third with 374 points to claim one of the two places on the podium along with Hong Kong’s Mak Kwok Fai and Lai Wai Kit, who had 373 points. “I could not sleep last night and ate only fruit at breakfast. It’s tough, the blood circulation shoots up with tension, we beat China and Singapore, it’s great result for us,” said an elated Sarkar, who is a teacher at Jadavpur University.